MLA BeefUp Forums were held in the Northern Territory towns of Adelaide River and Mataranka in August, covering topics such as business management, markets, northern beef research and breeder management. 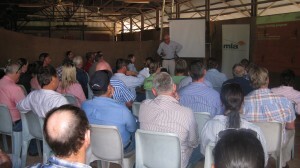 Both forums were well attended with 45 participants attending Adelaide River and over 50 attending Mataranka. NT Department of Primary Industry and Fisheries (NT DPIF) staff involved in pastoral production and rangelands research presented project highlights from the Phosphorus Project, Pigeon Hole Project (development of cattle stations in northern Australia) , Cash Cow Project (lifting the performance of breeding herds in northern Australia) and the 2010 Pastoral Industry Survey. Guest speaker Phil Holmes gave a thought provoking presentation, challenging producers to think hard about their property’s profit generating capabilities and how this matches up to their desired living standards. Phil quoted a figure from a case study he conducted over eight properties from the Gulf to the Kimberley, where it showed that the average result could not meet the minimum criteria for economic sustainability. “It is essential to know what your key profit drivers are, because with very small changes in these areas, most beef businesses can be transformed,” Mr Holmes said. Other speakers included Ben Thomas (Senior Beef Market Analyst, MLA) who provided an overview of the trends in the beef markets both nationally and internationally, Geoff Niethe (Co-ordinator for Animal Prodution, MLA) who gave an update on four recent projects that have provided valuable information about how to better manage the breeder herd, and Mick Quirk (Manager of Northern Beef, MLA) who provided a summary of other research projects underway in the region. The day prior to the Mataranka BeefUp Forum a Northern Beef Industry Next Gen Forum was held which invited young people in the industry to network with like-minded peers, gain insights from guest speakers on career pathways and learn how to set effective goals to reach career ambitions. The Next Gen Forum also gave the opportunity to network with some inspirational industry leaders, one of which was Keith Holzwart, owner of Avago Station. Keith provided the closing statements and told his tale of how a ringer can become a station owner with the right mindset, attitude and work ethic. This was the first of hopefully many more Next Gen Forums to come after the feedback received was positive, providing inspiration to organisers to facilitate a larger version of the workshop in 2014. The Forum attracted 19 participants from a variety of agricultural backgrounds. 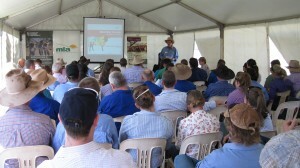 Thank you to Meat & Livestock Australia, NT DPIF staff and contributing stakeholders for making this event possible.